What service does Minuteman offer? *We provide services for residential homes as well as commercial businesses. We cover ants, termites, bees, fleas, bedbugs, mice, problem wildlife, moths, spiders, centipedes, millipedes, lady bugs, stink bugs, rats, roaches and more. Does Minuteman Pest Control offer discounts? *Yes. Call our office and we will give you all information to access your account and pay your bill online. *Cash, Check or charge at the time of most services. We accept Visa, MasterCard and Discover. Does Minuteman offer an all-inclusive package that covers all pests under one price? *No. 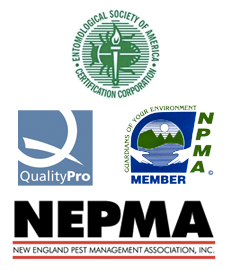 Minuteman practices IPM (Integrated Pest Management). This is an effective and environmentally sensitive approach to pest management that relies on a combination of common-sense practices and the use of pesticides only when necessary. We treat each pest problem individually as it is needed. Prevention is a key factor in pest control. Practicing good sanitation and getting annual inspections are highly recommended to prevent pest issues. Does Minuteman offer Free Estimates? *Yes. Minuteman offers free estimates for all wood destroying insects and some others (example: termites, carpenter ants, carpenter bees, and preventative services-lady bug, stink bug, bees). Some pest problems require inspections (example: bedbugs, problem wildlife) and charges do apply. Not all services require a preliminary estimate or inspection (example: mice, roaches, fleas and spiders to name a few). You can always submit a free online quote inquiry on our website if you are interested in more details about our services and pricing. What is the difference between an inspection and an estimate? *Estimates are free and are assessments of potential problem areas (example: sawdust in basement, wood damage etc. ).There is a charge for an inspection (charge can vary depending on size of home). An inspection is a more in depth examination of your home. It is at an inspection we will look for potential pest problems vs. an estimate where we are assessing a current one. Some issues do require inspections to determined treatment needed (example: bedbugs, wildlife). Does Minuteman have a cancelation list? *Yes. We keep an ongoing cancelation list. What is the difference between regular ants and carpenter ants? *Regular ants are smaller in size and can be a brown color. Carpenter ants are large and black. If you are unsure if you have regular ants or carpenter ants than you could bring a sample into our office in a sealed clear container (Tupper ware or zip lock bag) and an entomologist can identify it at no charge. What do I do if I have Carpenter Ants? *If you are seeing carpenter ants in large numbers greater than 20 daily and/or concentrated to one area, then we would schedule a free estimate to determine what is needed for treatment. If you are seeing a few here or there or not consistently seeing them we would suggest starting with an outside service. An outside service can take up to 4 weeks to take effect. If activity persists after that time; an interior treatment may be needed at an additional charge. What do I do if I have regular ants? *For regular ants (soil ants or sugar ants) we would schedule a treatment. For a regular ant treatment our technician would spray the exterior (exterior foundation, where foundation meets the ground, lower window wells, door casings, etc.) and then the technician would bait the interior in critical areas in which we are seeing them. Prices may vary-Call our office for more details. What do I do if work is being done to my home and carpenter ants are found? *Most of the time, carpenter ants are found in an area that is being fixed due to a moisture issue. The moisture issue is what the ants are attracted to so fixing this is paramount. Replacing the wood is important also. If damaged wood is replaced, the colony will most likely be removed as well. It is also important to have Minuteman come out and assess the situation to suggest ways to help prevent future problems with carpenter ants. However it is not vital for us to come out the same day. *No. Unlike termites, carpenter ants do not eat wood. They extricate galleries in wood and push out sawdust for nesting areas. Do you offer maintenance programs for ants? *Yes. Minuteman offers an annual two times a year exterior home service program. The technician will come out annually (program renews each year automatically). The technician will treat areas on the exterior (exterior foundation, where foundation meets the ground, lower window wells, door casings, etc.). This service us geared more towards carpenter ants but can help cut down on other ants and insects as well. This service is done once in the spring (as early as Mid-March through May) and a second time mid to late summer. Depending on when your first application is complete will determine when your second is done (can be anywhere from Mid-July to End of Sept or even early October-depending on season, weather, etc.) Please remember: Program renews each year automatically. Minuteman requires 30-day written notice of cancelation. If in the event your property is sold please contact Minuteman Pest Control immediately to discontinue services or you will be responsible for payment for services rendered. Will rain affect my exterior service? *Minuteman will not treat if it is raining heavily at the time of the service. The material we use dries very quickly and is not affected if it is to rain later on in the day or the following day. Our technicians are trained to know when the best time is to treat. Are treatments safe for pets and small children? *We advise keeping pets and small children indoors at the time of the exterior application only because they can be curious with a stranger walking around the yard. It is ok for them to go outside once application is complete. The material we use dries very quickly and has no airborne residual and no odor. If treatment is done to the interior it is concentrated to critical areas (cracks, crevices, problem areas only are targeted). Our technicians are very mindful of pets and small children when performing any service. *Regular Ant treatments come with a 60 day guarantee. A one-time carpenter ant exterior service has no guarantee. A full carpenter ant treatment has a 60 day guarantee and can be extended if you are to go on the maintenance program for carpenter ants and remain on program consistently with no gaps in between services. How do I help minimize risk of bedbugs? *First thing you can do is ask the front desk if the room you are in has a history of bedbugs. Do not place luggage on the luggage rack or floor. We recommend putting it in the bath tub until you are going to use it and to refrain from using hotel/motel dressers. Preform an inspection to the bed with flashlight. Pull back the corners of sheets to look at mattress corners and behind headboard for any staining, spotting or live bugs. If you believe any evidence is found; demand to be moved to another room opposite side of the hotel. What do I do if I think I have bedbugs? *Your first step is scheduling a Bedbug Inspection (charges apply). It requires two technicians to perform a thorough inspection of the bedroom or rooms in question. At the inspection it is determined if bedbugs are present and what the approximate cost of treatment would be and entail. What do I do prior to a bedbug inspection? *Prior to the inspection it is important not to do too much. Avoid moving any items to other areas of the home to avoid infesting other parts of the home. Any suspected bedding or laundry is to be laundered and dried on high heat and then bagged in air tight bags. * It is best to keep all items bagged as previously instructed in prep for the treatment. Do not put any clothing or items back in drawers until instructed by the technician. If you are going to be traveling while undergoing treatment we strongly advise inspecting luggage outside prior to bringing items within the home and to launder clothing and dry on high heat. It is best to keep luggage out of the home and brought back in once laundered on high heat or if visual inspection of luggage shows no evidence of bedbugs. Do you remove bee nests? *Minuteman will treat the bees nest. We will treat it using a spray or dust depending on the type of bee. We do not remove the nest because it is not always safe to remove at the time of treating. We advise you to remove it once it is completely inactive. How long does the treatment to take effect? *If the treatment is done late summer and fall it may take up to 30 days for full and complete elimination of yellow jackets, wasps, or hornets. Each treatment is guaranteed for the season so if activity persists after this allotted time period call our office immediately. Do you treat for honeybees? *No. Honey bees are beneficial to the Earth. If you have a honey bee issue we would refer you to a local bee keeper. Do you treat carpenter bees? *Yes. Minuteman would come out for a free estimate to determine approximate cost of a treatment. Do you repair carpenter bee damage? *No. Minuteman recommends either sealing up holes or damage with wood sealant and repainting/staining wood or replacing damaged wood with a new piece in the Fall. What does Minuteman do for mice? *Minuteman places tamper-resistant rodent bait stations in critical areas of your home and garage. Where do the mice go to die? *Mice return to the nesting area where they will pass on. This could be within the home or outside. Will there be an odor if the mice die within the walls? *There can be an odor if there is a serious or more severe mouse infestation. It is also possible to have a slight odor if they die close to a heating source. This odor can last 2-3 weeks but is not permanent. How long before I can expect to see results after a set up? *It can take 4-8 weeks to eliminate the current infestation depending on how long issue has been going on and how many mice are entering your home. *The chance of secondary poisoning is almost zero. Is there an antidote for the bait? *Yes. Vitamin K is the antidote that can be administered by your Veterinarian. Do you deal with problem wildlife removal? *Yes. Minuteman will have a wildlife specialist contact you within the business day to go over procedure and pricing. They do their own schedule so we have them speak to customers one on one. Do you do free estimates for Wildlife? *No. Minuteman recommends a Wildlife Assessment Inspection of the exterior and interior of your property, prior to any Exclusion/Removal program. The Wildlife Inspection fees can vary depending on difficulty of the inspection and location of your property. There is no set pricing on Exclusion/Removal. Each house is different and offers its’ own unique set of differences with regard to the animal or animals involved, location of entry points and the amount of exclusion needed to prevent future nuisance wildlife from re-entering. The inspection is the first step to determine approximate pricing for services needed.